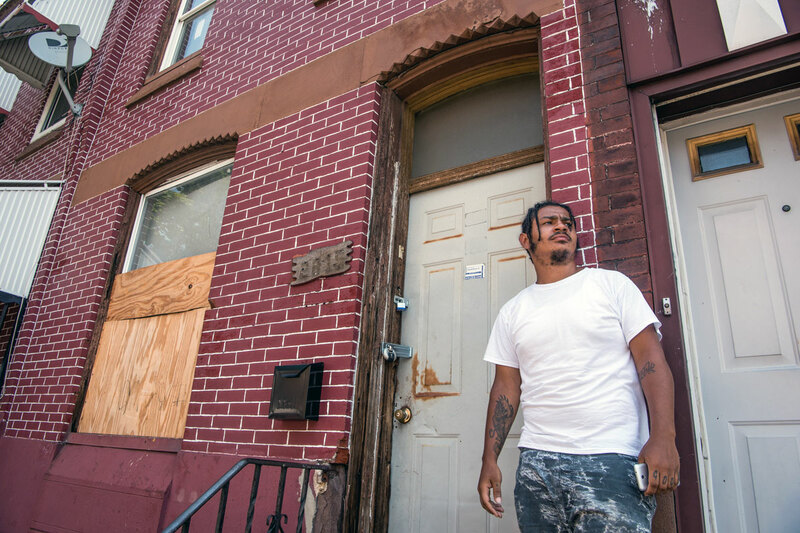 Donahue Holloway sat on the stoop of an abandoned store, on a North Philadelphia street scarred by boarded-up rowhomes, graffiti and trash, 10 miles and a world away from the bright lights of the Democratic National Convention. Holloway, 57, wasn't worried whether Hillary Clinton would defeat Donald Trump. He was worried about finding a second job to make up for poor business at his barbershop. He's lived near Cambria and Front streets in Fairhill his whole life, and only has seen the neighborhood get worse. "Do they care?" he said of the politicians who have flocked to Philadelphia for the convention. "People want jobs, we want new homes, which we know we're not going to get. What's a president going to do about that?" The nation is focused on Philadelphia as a smiling, spruced up city hosting hordes of delegates, visitors, protesters and journalists. 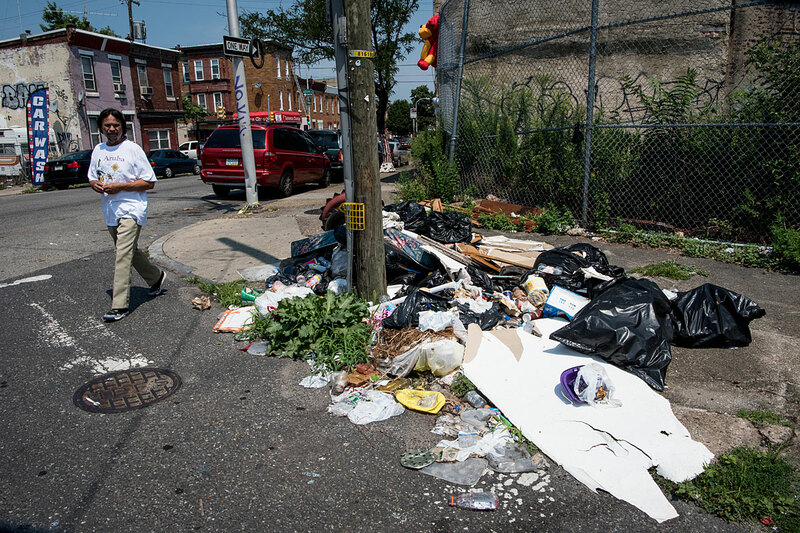 But away from the TV cameras, thousands who live in the poorest neighborhoods know it's unlikely that outsiders will see their Philadelphia, one defined by poverty, hardship and hopelessness. Carmen D. Torres, who lives on Cambria Street, rolled her eyes at talk of the convention. "Every election," she said, "it's still the same. "Drugs on the corner, dead [people] under the bridge." Torres, 63, concentrates on her family, and protecting them from drugs and violence in a community that's always been her home. Her vigilance has allowed a daughter to graduate from college and a son to become a police officer. She can't believe any politician could fix her neighborhood. Studies show many poorer citizens have opted out of the political process, believing it's pointless to vote. Other barriers include lack of time, transportation and knowledge of the issues. So those who most need government to work for them are often absent from the polls. In America there exists a "vast gulf in financial well-being between voters and nonvoters," a 2014 Pew Research Center study found. Nearly half of nonvoters had family incomes of less than $30,000, compared to only 19 percent of voters. A 2015 Pew project found that the "least financially secure" Americans, those who have trouble paying bills, receive government support, and have poor credit, were far less likely to register, to vote, or to know which party controls Congress. The numbers come to life in conversations with people who live in a part of Philadelphia so bleak it's widely known as the Badlands. North Philadelphia was once prosperous, an industrial-age dynamo in which working-class jobs could be found at factories and machine shops. New rail lines brought in supplies and shipped out finished goods. Many wealthy company executives chose to live near their work, taking residence in opulent estates, the remains of which can be seen today. In the early 1900s, large numbers of African Americans arrived from the South, seeking jobs and better lives, some at the Ford, Cadillac and Packard automobile factories that lined Broad Street. Theaters and jazz clubs blossomed, and the Athletics and then the Phillies played at Shibe Park, later renamed Connie Mack Stadium. But factory closings in the 1950s and 1960s hurt the area, and white flight accelerated the decline. Many of the stores that were looted during the 1964 Columbia Avenue riot never reopened, taking jobs and capital out of the neighborhood. Elizabeth Torres, 35, said she may watch some of the convention on TV, but she doesn't follow politics enough to know which candidate she might support. She knows, though, what's wrong with her neighborhood. "You want to walk safe in the streets, but you can't," she said outside her Cambria Street home. Like her neighbors, she sat in the only shade on the treeless street - a fabric canopy she put up on the sidewalk, decorated with Christmas lights. Politicians "don't come to this side of town, because this side of town is bad," she said. Ruth Marquez, waiting for a bus, had nothing to say about the possible value of having the Democratic convention in Philadelphia. "Look where I live at," she said. "Everyone, everyday, is hustling to figure out where you're getting your food from . . . Everything that goes on downtown, to me, is like a showboat." This week the city shows off its world-class museums and restaurants, its walkable downtown, its rich and vibrant diversity. But 26 percent of Philadelphians live in poverty - well above the national average of 14.8 percent. In some parts of North Philadelphia, up to 70 percent of residents live below the federal poverty line, defined as a family of two adults and two children with household income of less than $24,000. Many exist in what's called "deep poverty" - less than $12,000 for a family of four. "If you're a mom and you've gotten a notice that you're going to lose your apartment," said Cathleen Palm, founder of the Center for Children's Justice, "you're not tuned in to what either political party is saying." Programs that serve needy women and children are struggling. Each year more than 500 infants enter emergency shelters in Philadelphia, she said, a crisis fueled by poverty, drugs and desperation. "There's so much work to be done, there's not a lot of time to have a party," Palm said. At Ready, Willing & Able, a program that tackles addiction and recidivism by helping the homeless to find work, no one is staying up late to watch convention speeches. "They're focused on trying to get back on their feet," said Executive Director Jason Miller. Adam Plaza is doing the same. He lives in the Badlands, and dropped out of high school to sell drugs. Then he went to prison. In his neighborhood, it's drug dealers and addicts - not children - who claim the parks. Men hang around corners selling drugs, the surest source of income around here. Plaza, 29, got out of prison six months ago. Now he works as a landscaper, wants to get his GED and to be a good father to his son, who turns 4 this week. He wants something else too: For the politicians on TV to come and visit. "Some of them need to come down here and see this neighborhood," Plaza said. "We're stuck here."